JAMES RAMSAY MACDONALD Photograph SIGNED. British (Scottish) Labour politician and twice Prime Minister (1924 and 1929-1935). Photograph Signed. The half-length portrait shows Ramsay Macdonald as pensive, earnest and slightly weak looking, belying his shrewd political mind. 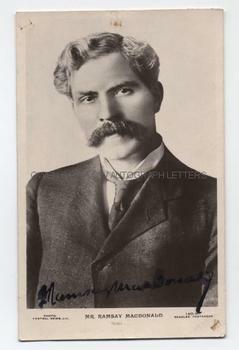 The portrait is a real photo post-card by Beagles of an image by Central News Ltd. Ramsay Macdonald has signed boldly across the foot of the image but the SIGNATURE is somewhat smudged and blotted. Approx 5.5 x 3.5 inches. Very slight marks to corners, else fine. James Ramsay Macdonald, a powerful orator, was one of the three founders of the Labour Party and was Labour's first Prime Minister. His pacifist politics made him unpopular during WW1 but with public disillusionment after 1918 he gained support for his socialist ideals and his new Labour Party quickly replaced the Liberals as the 2nd biggest party in the UK. Signed photographs of Ramsay Macdonald are rather uncommon.